And even delays in confirmation could damage the Trump agenda. Given the prominence of the fight over the Affordable Care Act, there is no more pivotal figure in Donald Trump’s cabinet than Georgia Congressman Tom Price, the nominee for Health and Human Services Secretary. Trump has already predicated his bizarre vow of “insurance for everybody” on Price’s confirmation, saying he will not release his health care plan until that time. The Republican Congress, with no consensus of their own, awaits Trump’s directive, so any delay in Price’s confirmation puts what has become the top legislative priority in the first hundred days on hold. With that in mind, maybe the Trump “extreme vetting” team should have figured out at some point that Price had a chronic insider trading problem. Price got a $1,000 PAC donation from Zimmer Biomet after introducing the bill. Prior to the bill, Price got another $1,000 from the company after writing a letter to CMS calling for delays in the regulation. This was a common practice for Price: advocating to federal agencies on behalf of campaign donors. The Zimmer Biomet numbers are relatively paltry, but they reflect a pattern. The Wall Street Journal reported in December that Price traded $300,000 in medical stocks over the past four years, while pursuing legislation that could impact their bottom line. Some of the laws got through; the recently passed 21st Century Cures Act will accelerate approval of certain drugs, including one for multiple sclerosis manufactured by Innate Immunotherapeutics, which Price holds stock in. As Kaiser Health News reported, Price received between $50,000 and $100,000 of Innate stock last August through a special private placement at just 18 cents per share. The price is up to $1.30, a seven-fold increase. Price has vowed to divest from 43 medical-related stocks upon becoming HHS Secretary. But his House activity could violate the STOCK Act, which sought to prevent insider trading among members of Congress. Price voted for the STOCK Act, which passed the House 417-2 in February 2012. The law appears to have been written with actions like his in mind, and Senate Democrats have pounced. Minority Leader Chuck Schumer wants the Office of Congressional Ethics, which Republicans tried to neuter earlier this month before changing plans, to investigate the matter. “This isn’t just a couple of questionable trades, but rather a clear and troubling pattern,” Schumer said in a statement. This kind of apparent corruption dwarfs lesser offenses that torpedoed cabinet hopefuls in previous administrations. But it may not bottle up Price’s confirmation at all—three Republicans would have to reject him in order for the vote to fail. Given Price’s central role in the health care overhaul, that seems unlikely. But it certainly could lead to delays. Price has a confirmation hearing at the Senate Health, Education, Labor and Pensions Committee this week, but that’s mostly for show. His real hearing is with the Senate Finance Committee, and only it will vote to advance his nomination to the floor. That hearing hasn’t been scheduled. And Chuck Grassley, a longtime crusader for the STOCK Act, could complicate matters at Finance. The 14-12 partisan split on the committee means that Grassley has the power to hold up Price’s nomination, and he’s stubborn enough to make a fuss over the dodgy stock trades. Even without an outright loss in the Senate, a delay freezes the Obamacare repeal plan in amber. And that gives a newly energized resistance more time to make life miserable for GOP lawmakers. In controversial legislative fights, forward momentum matters a great deal. Having to sweat out a Senate confirmation creates a narrative of failure and allows Democrats to step up attacks. Price’s itchy trading finger could seriously damage repeal efforts. Meanwhile, another nominee, Trump’s labor-secretary pick Andy Puzder, is telling confidants that he wants out. He has reportedly not taken kindly to pointed criticism from Democrats and labor groups, or the mountain of paperwork needed to file with ethics officials. Or at least that’s the cover story. Nobody in the press should make predictions about politics ever again after what happened in November, but I actually wrote that Puzder would be the first cabinet casualty days after he was announced. My rationale had nothing to do with Puzder’s spotty labor record as CEO of Hardee’s and Carl’s Jr., but with the nominee’s heresy on supporting immigrant labor, which didn’t escape the notice of the far right. Not only did this anger the only interest group that could realistically take Puzder down in the Senate, it made the base less likely to care to rescue him if anything untoward came to light. And I’d call Puzder’s ex-wife going on The Oprah Winfrey Show in disguise in the 1980s to reveal the pain of domestic violence as something that requires a rescue. Previously, Lisa Fierstein, the ex-wife, has said that she made up multiple claims of abuse during her marriage to get an upper hand in divorce proceedings (even though there are court documents showing abuse claims from before the divorce). But showing up on Oprah in disguise doesn’t fit with that story. And Puzder’s own spokesman confirmed the appearance. Hearings for the labor secretary nominee were indefinitely postponed last week, the second such delay. If the Oprah tape ever gets found, the Breitbart crowd will likely sit back and watch Puzder squirm rather than step in. 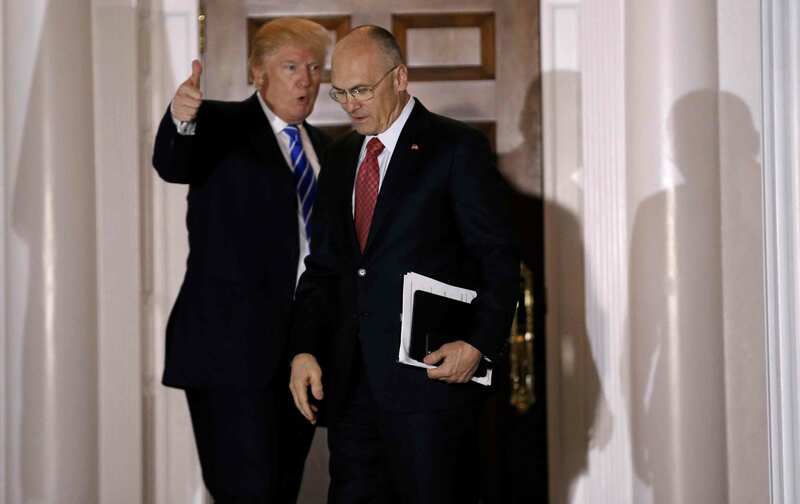 With a relentless opposition and no grassroots support on his own side, it could only get worse for Puzder, unless he chooses to exit the spotlight with his reputation half-intact. Senate Republicans could swallow their pride and confirm both nominees, making these early stumbles a memory. Or the trouble could reflect an inattentive transition to a chaotic presidency marked by failure after failure.